I have previously started and posted on a Fictional Highways Bering Strait Bridge and/or Tunnel thread because some plans included a highway component. Recently, discussions have focused on the idea of a Bering Strait railway tunnel, but no highway. Recent articles have mentioned interest from both Russian governmental officials and U.S. business interests. I include it as Off-Topic in this Forum because it may one day be a cool rail link for a multi-continental drive in one car. A decision on building a tunnel under the Bering Strait to connect the railway infrastructures of Russia and North America should be made before 2017, Russian Railways President Vladimir Yakunin told journalists on Saturday, Apr. 7. "I am sure that Russia needs to develop railway services in the Far East and Kamchatka, and I believe a decision on building [a tunnel under the Bering Strait] should be made within the next three to five years. I mean a decision should be made that this should be done in principle," Yakunin said. "These are not just dreams. I said about this for the first time when I took this office," he said. Yakunin said that, five years after he became the Russian Railways president, he was approached by some U.S. business people who suggested that research should be done on building such a link. "So these are not just dreams. As a matter of fact, a design of this project is being worked on now," he said. "As for when this could be put into practice, I think it should take 10 to 15 years," Yakunin said. The project can be implemented only based on multilateral cooperation between various countries, Yakunin said. "America should be on the one side and Russia on the other. China is interested as well, and so multilateral cooperation is inevitable," he said. From the Alaskan side: An Anchorage businessman is trying to attract investors in and has started a website about a Bering Strait rail tunnel. Who knows? As outlandish as it might seem, construction on a Bering Strait rail tunnel could conceivably start before construction of an I-69 bridge over the Mississippi River. As I have mentioned many times before, aside from the thousands of kilometers of new-ROW railroad trackage that would have to be built on both sides to reach such a crossing, the issue of the fact that Russia's railroads (1520 mm track gauge/SA3 couplers) are 100% incompatible with those of North America (1435 mm track gauge/AAR 'knuckle' couplers) must be addressed. Assuming that the Chinese are also interested (as stated above), that would make it a 'no-brainer' that the tunnel and approach trackage in far eastern Russia be built to North American railroad standards, as Chinese railroads also operate on the standards used in North America, and that transloading facilities be built at the standard 'break' somewhere north of Vladivostok so that traffic to and from Russia (and the rest of the former Soviet Empire) can use it. We'll see where this goes, especially since Pacific coast seaports in North America are nearly maxed out in traffic carrying capacity. The currently under construction upgrades to the Panama Canal will alleviate that situation to at least some extent. I imagine the cost of new trackage to reach the Bering Strait would be almost equal, if not greater than the cost of the actual tunnel itself. That's a long way to go from western Alaska to northern British Columbia or southern NW Territories. Lots of good-sized mountains in between, too. Might as well build the road to Nome while we're at it. You could probably build a dozen large, deep-water ports in both Asia and North America for the cost of the rail tunnel and railroads approaching it on both sides. And the ports would be usable year-round, while the railroads would be closed from October to May. And about the gauge, your suggestion that it be North American standard gauge makes sense technically and from a cost point of view. But do not underestimate Russian Not Invented Here syndrome and general paranoia. The reason Russia has a different track gauge than Europe is to slow down any possible invasion using European gauge trains as they crossed the Russian frontier, plus general desire to say "ours is bigger". I bet Russia would insist on the Russian portion being built to Russian gauge, and if it's silly to change gauges twice from Canada to China, that's just too bad. To critics who worry about harsh winter weather, Russian Railways notes that since 1915, the company has been running passenger and freight trains year round to Murmansk, located 300 miles north of the Arctic Circle. The proposed route for a tunnel under the Bering Strait would pass 50 kilometers south of the Arctic Circle. The current price tag for the missing 10,000 kilometers, tunnel included: $100 billion. Freight fees are estimated at $11 billion a year. Russian Railways estimates that a Bering Strait tunnel could eventually handle 3 percent of the world’s freight cargo. Yakunin says that China is interested in the project. At a railway meeting in Moscow Thursday, Mr. Putin said that freight traffic on a main Siberian line, the Baikal-Amur Mainline, is expected to nearly triple by 2020. Russia’s Urals oil has been over $100 a barrel for a year now. The country’s budgets are balanced. Debt is low. Savings are piling up. Russians are getting their pre-recession mojo back. On the consumer end, sales of foreign cars made in Russia jumped 90 percent during the first quarter of 2012 over last year. In the Kremlin, leaders are thinking big again. In rapid succession, the government leaked a plan to create a “super agency” to develop the Russian Far East; President-elect Vladimir Putin vowed to spend $17 billion a year for new and improved railroads, and Vladimir Yakunin, president of Russian Railways, promoted a think big plan — a rail and tunnel link connecting Russia and the United States. Yakunin estimates that the Russian side of a trans Bering railroad would take 10 to 15 years to build. That could fit into the political calendar of his friend Mr. Putin. On May 7, Mr. Putin will be inaugurated for a new six year term. He has left open the possibility of running in 2018 for another six year term. So Russian Railways may have the political cover for another 12 years. The question is whether oil prices will stay high enough to build a tunnel linking America and Asia. If so, Washington’s diplomatic reset with Moscow could be welded in steel. On the American side, I wonder how fierce environmental opposition to the project would be? Also consider that we're talking about building a tunnel between two countries which within the last century spent decades at each others' throats. It was only five years or so ago that Mr. Putin was vehemently opposing President Bush's plans to put missiles in Ukraine aimed at Iran, over concern that they could easily be re-targeted at Russia. I wonder whether the US and Russia could get together the level of cooperation necessary for such a project. Consider as well that Canada would have to be involved for the connecting railroad (although that's really a non-issue, no tensions there). Russia is perfectly capable of building such a project. But in the US there is of course the environmental lobby, as well as a couple other political issues. Concern that such a link would make it easier for more American jobs to be outsourced to China. Opposition from shipping companies and from the major ports of the west coast. Yep, there's thousands of miles of rails to be built with sidings and spurs. A lot of 4ft 8-1/2in rail and a lot of 5ft rail, and some way to interchange between the two at both the US/Russia border and the Russia/China border. 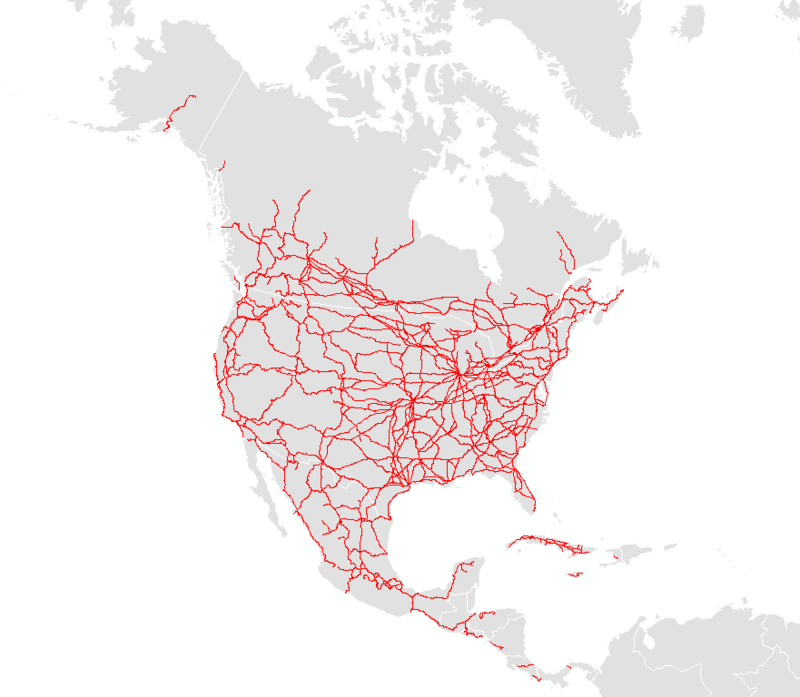 However, one major advantage of building it would be to connect Alaska via rail with the continental US and Canada. This might help better connect Alaska with the rest of the US and make goods cheaper to transport to/from Alaska. Even without the tunnel to Russia, this might not be a bad idea. To be fair to Putin, Russia has seen other countries go from friends to enemies in short order many times (the most infamous being Nazi Germany), so I can see why they'd be unsettled by US missiles being so close. Interesting about the railroad to Murmansk. I'm not sure it's comparable, though, there's more than just how far north it is. How mountainous is the route and how many inches of snow do they get? The cost estimates for the railroads are just that, estimates. And I don't see any estimates of operating costs. How much will all that snow clearing cost, if it's really to be kept operating all winter? There's numerous places a major port could be built on the U.S. west coast that would probably cost less than $2 billion, including rail access. How long would it take by rail from Seattle to Shanghai? I'm thinking not much faster than ship. They still have not addressed the very real issue of the incompatibility between Russian and North American/Chinese railroads (1520 mm track gauge/SA3 couplers vs. 1435 mm track gauge/AAR couplers - note that the latter two systems are 100% compatible with each other). This Mega Engineering: Building a Transcontinental Tunnel video puts forth the argument that, because of the earth's curvature, a Shanghai-to-Los Angeles rail trip would be faster than shipping across the Pacific. Probably hyperbole, but it speaks in terms of "days, not weeks". I'll leave it to others to discern the BS factor. Also, in comparing the cost of the tunnel to new port(s), I believe the US, Canadian, Russian and Chinese governments would factor in projected benefits from pipelines, etc. that would possibly be included in the tunnel. In theory, the pipelines would provide cheaper energy. As regards new ports, the proposed Mexican Punta Colonet superport has run into problems and delays. Building a new port nowadays is no simple feat, either. I can easily imagine NIMBY resistance along the U.S. Pacific Coast to suggestions of new ports. The tunnel and the related rail inks would be an incredibly difficult undertaking; that said, I don't think the idea can be summarily dismissed. As for new port facilities on the Pacific coast of North America, there are no places left in the 'lower 48' USA to build a new seaport. A seaport is under major expansion at Prince Rupert, BC (I'm seeing an increasing frequency of container trains from it on the CN mainline that passes though my area here in eastern Wisconsin) as well as that project in northwestern Mexico, but that would pretty much max out the west coast's ultimate 'buildout' port capacity. As for new port facilities on the Pacific coast of North America, there are no places left in the 'lower 48' USA to build a new seaport. The Port of Coos Bay is available for building a cargo container facility. Currently the port is trying to get some action going on this front. The closed rail line has been partially reopened to the North Spit and more reconstruction is going on. The real hangups are procedural and financial as there are so many hoops to jump through these days just to put in a dock and the cash flow streams are so diverse instead of unified, which makes it a struggle to put the pile of moolah needed together in one lump. Just the permitting for a dock runs $10 million as per an article in our local paper from a few years back. When the Port of Coos Bay was at it's peak in the Sixties and early Seventies, it was the world's largest port for the shipment of wood products. The port's natural attributes are the best for an American Pacific coastal port outside of the Port of San Francisco. If we had gone about building things the way we currently do back in World War II, we'd all be singing the Horst Wessel song or bowing to the Mikado. Back then we built the entire Alaska Highway in one construction season. According to the transcontinental railway project, it is designed as polimagistral, ie combines rail and roads, power lines, oil and gas pipelines, telecommunications cables. All of them are combined in a tunnel under the Bering Strait, forming a single transport-energy-telecom corridor. This will provide significant savings compared to the investment options of separate structures and thoroughfares through the strait on either side. In regard of all aspects of construction the railroad in Russia, please read the last publications on this matter: http://blogs.voanews.com/russia-watch/2012/04/28/join-russia-and-usa-by-rail-tunnels-under-the-bering-strait/ , Dr. Victor Razbegin's 2007 presentation http://www.schillerinstitute.org/conf-iclc/2007/landbridge_conf_razbegin.html , and also check the materials from the last year Conference in Yakutsk, Russia: http://www.interbering.com/Russian-North-East-Development.html . Thank you for your interest in the Interhemispheric railroad construction! If the Chinese and Russians want to build a road on their side, a 555 mile new terrain roadway in Alaska might be doable (BTW I am NOT suggesting four-lane interstate grade). "polimagistral" is probably a direct transliteration from the Russian word for "multimodal" or whatever we'd call it. Capacity in west coast ports will stop being an issue once the Panama Canal expansion is completed. Then the capacity problem will be on the east coast, with all the large container ships from Asia coming directly here rather than going to the west coast and trucking or training cross country. Not because it will be faster (it probably won't be), but because it will be cheaper and logistically simpler. Which brings up the point that, for most goods which are manufactured in East Asia, the primary concern in shipping them to the US is cost, not speed. Even if it is faster, a Bering rail connection won't draw as much traffic as you might think because it will also be more expensive. The Russian part being a different rail gauge will only add to the extra cost. The problems with gauge changing equipment is that it is very expensive and might not be satisfactory for use on heavy freight equipment. The only places in the World where automatic gauge-changing equipment is used is on a handful of passenger lines in Europe, especially on trains running between France and Spain (Spain is gradually converting its broad-gauge track to standard gauge). Elsewise, gauge-changing is accomplished by physically changing out the wheelsets/'bogies' on the equipment or by transloading the freight, a slow and laborious process. Also, the couplers between North America and China vs. Russia are completely incompatible. As for dual-gauge track, the difference in the two systems' track gauges is about as insidious as it can get - 85 mm. They are too far apart for equipment to be able to run directly between each other and too close to allow for the easy creation of dual-gauge track by simply laying a third running rail. Dual-gauge facilities would require either 'gauntleted' four running rail dual-gauge track or building completely separate grades. The couplers aren't an issue so long as you don't mix them. If a train headed from China to North America can change gauge and keep its knuckle couplers, there's nothing stopping it from doing so. It's only a problem if you want to attach Russian cars to the train. Personally, I think "polimagistral" is a better word than "multimodal". I say we adopt it into English -- and it's pronounced poleemageestral; try to roll the r.
Mike, they're called "trucks", and you can use trucks that can go between 4'8-1/2" and 5' track. It's still a difference of 3-3/4". Split in half, that's still 1-7/8" between the two sets of rails. More than enough to use a set of trucks that works between the two systems. IIRC, they use similar truck in Europe already. In addition, if the main route is to go between the US and China, Russia may (that's may, not will) agree to 4' 8-1/2" track between the two if that's where the line will go and have a yard for changing out the trucks further inland, nearer the Trans-Siberian Railway. Either that, or we have a yard near Fairbanks that changes out the trucks, and we build a 5' line from there to Russia. All this fuss about gauge-changing - they do it already between Russia and China (plus various other places). Does it matter if the process takes a short while? Both Russia and the US have stringent border controls, so immigration/customs/tunnel safety checks/etc can be on-going. IIRC with the Polish-Belarusian border on the Berlin-Moscow trains it's the border controls that take longer (and then only a couple of hours - which for intercontinental freight is nothing). Plus a project of this magnitude might look into the tech that they use on the Franco-Spanish border (and on Spanish high-speed to classic line connections) and work out how to apply it to the Soviet-standard gauge changes - though tbh, Poland-Lithuania or Sweden-Finland (or the current Romania-Moldova if it becomes an internal border as they want it to be) borders are much more likely to get it done due to there being no border controls.